There are 8 posts tagged gandhi (this is page 1 of 2). Anna Hazare has been voted as the Person of the Year / The Indian of the Year by many news channels and newspapers recently. Even international press has noted him as one of the top news makers of the world in 2011. And why not? After all, this 74 year old Gandhian has changed the way Indians look at corruption and given all of us hope that this disease can be removed from our country. As I wrote in a poem, he has come as our Messenger of Hope in 2011. Anna Hazare has spend all his life promoting the decentralization of power in democracy and his asking for a Lokpal, free of any government control, is another step in this direction. By directly involving the people in his protests, and highlighting the point that the people are the real masters and the politicians only public servants elected by them, he has made it clear that they should proceed in accordance of the will of the public. He and his team have taken the issue of Lokpal to the people in small towns and villages, holding live debates and educating the people about the various fine points of the Lokpal Bill and the importance of each clause. This has never happened before. Politicians have never bothered to debate with the people about the fine prints of any bill. By involving the public and making them aware of why and what they are doing, they have enabled a healthy environment which has resulted in the strengthening of the democratic institution. 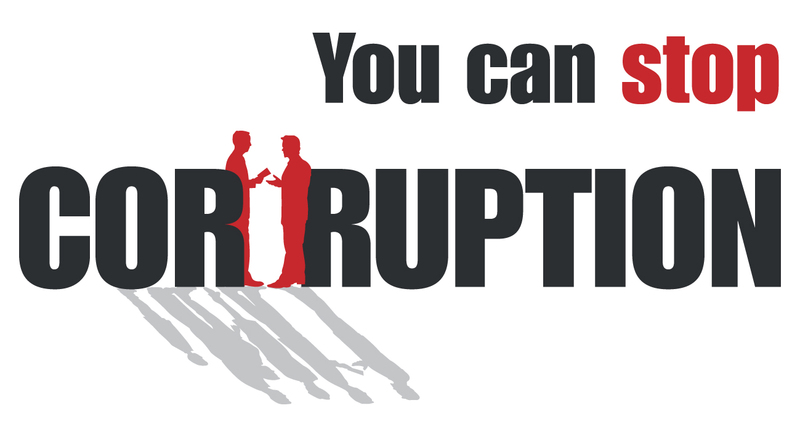 If you would have asked anyone about the issue of corruption in India at the start of the year 2011, you would have only got hopelessness and pessimism in return. But in one year, Anna has changed that mood to one of hope and optimism. People have seen the power of peaceful protests and how they can pressurize the government to do their job properly. This must be the biggest take-away from this movement. When India won the World Cup this year in April, people came out on the streets and danced and partied all night long. I wondered that do we have the same unity and patriotism for other issues which are much more important to our country. But my doubts were put to rest as during the two fast-unto-death’s which Anna underwent in April and August, he received huge support from people of all walks of life – from big cities to small towns and villages like. It was so glad to see the whole of India united and fighting for a cause that really matters to every one of us. It was India who gave the world the weapon of peaceful protest – Satyagraha. But questions have been raised in recent times about its relevance in a 21st century world. But this movement put all such speculations to rest and showed that Gandhian methods of peaceful and non-violent protest are as much effective today as they were 70 years go. It was amazing to see young leaders like Arvind Kejriwal and others using technology (internet, social media) to gather support and spread their word quickly among people. A famous quote says that “A patriot must always be ready to defend his country against his government“. This movement has shown the power of youth and the importance of patriotism in democracy. By coming out in big numbers and by even courting arrest in huge numbers, the Indian youth has shown the importance of public protests in democracy. It has shown to the world that even a corrupt government will find it difficult to operate if the public is aware and ready to hold the government accountable for their actions. I would like to conclude by saying that just as a strong and responsible opposition is needed to keep the government on its toes and working properly, a strong public (or civil society) is needed to keep any democratic institution on its toes to do its duty responsibly. We have seen a tremendous response to the peaceful protests triggered by Anna Hazare’s indefinite fast. People from all over the country, and even Indians living abroad, have shown their support for Anna Hazare and Jan Lokpal Bill by peacefully assembling and holding protest marches. He has united India across religions, caste, language or any other divisive factor. It is heartening to see India united for something other than cricket. The number of people who have protested have been humungous by any standards. 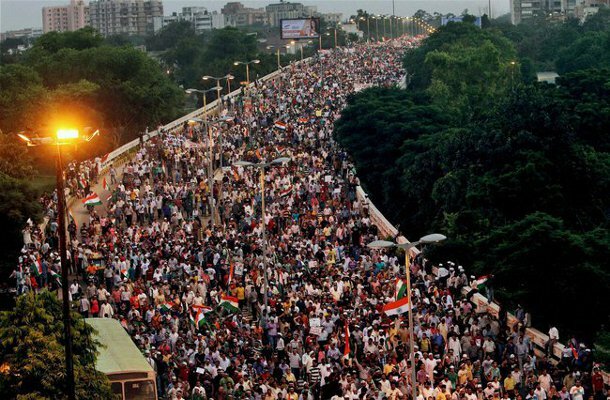 In Delhi and Mumbai each, more than a lakh people marched on 21 Aug 2011. Even in Bangalore, I have been hearing news of around 25000 or more people assembling daily. Similar stories are coming from other cities too, even smaller ones. While I don’t doubt that Anna has immensely resonated with the masses and given hope to millions of frustrated Indians, I also feel that going to a protest site is a very ‘easy and convenient‘ way of showing one’s support to Anna. 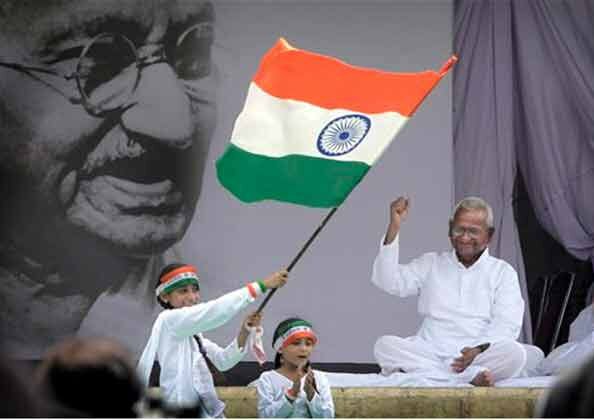 A real test of commitment to Anna and his Gandhian methods of protest would be if we inculcate many of his preachings in our daily life. Can we truly live by Gandhian principles? Can we live our lives truthfully and honestly, at home and at work, in public and in private, with friends and with family? 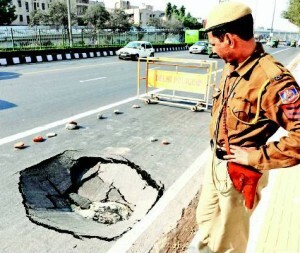 Can we pledge to not give any bribe to a cop, babu or a politician? Are we ready to suffer delays and other harassments which might occur when we refuse to pay bribes? Are we ready to sacrifice our personal comfort for the greater goal of a just society? Can we persist making these sacrifices and suffering even while others around us might not be doing so? Can we truly remove the thoughts of hatred from our minds for those who have been unfair to us? Can we love everyone alike, even our opponents, and demonstrate it in thought, word and deed? Can we hate the sin and not the sinner, and stand up against the sin but continue to love and forgive the sinner? The whole of Gandhi’s life and Anna Hazare’s work in Maharashtra has emphasized on the removal of untouchability and discrimination on basis of caste, language and social factors. The people of Ralegan Sidhi (Anna’s village) call it as a family and not as a village. Can we treat our fellow citizens as brothers and sisters and part of the same family? Can we look beyond our caste, language, economic status and love and treat each other alike? Are we ready to practice what Gandhi said, that we are all children of the same God, and any kind of discrimination would be reprehensible to Him? What I am trying to say that while it is very easy and convenient to show and voice our support in Anna Hazare in a rally, it would be very demanding and challenging to practice what Anna is following in his daily life. We might have to suffer some short term difficulties and make some sacrifices, but we all know in our hearts that the long term benefits of such a life are always good and more fulfilling. And leave alone corruption, we would remove all or most of the ills that plague our society if we live by the principles by which Anna, and other Gandhi followers live by. In my previous article, I had a doubt about how the public will react to Anna’s second fast unto death. I was more skeptical about the response to his Jail Bharo call. But I am glad all my skepticism has been proved wrong. The public has responded, and how. Tens of thousands of people have come out on the streets in support of Anna Hazare. People have courted arrests in hundreds and in Delhi, police has to convert a stadium into a jail to keep those arrested. 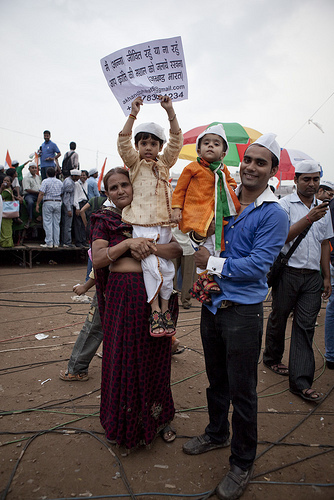 There were around 100,000 people marching to India Gate in Delhi and around Azad Maidan in Mumbai. Now can the government arrest them all? I am really glad that the public has risen to the call given by Anna Hazare. But what is special about Anna Hazare that he has galvanized the whole nation when most of us didn’t know him at all a few months ago. How is one man able to dictate terms to the government? How has he cut across the social and economic divides of the populace which is so deeply entrenched in our society? He is an ex-army man who fought in the 1965 Indo-Pak war and later build his village into a model village, self sustained and free of all social ills. People from all over the world have come to see the amazing work he has done. He has not married and devoted his entire life to his village, and later in his fight against corruption. After that he has fought corruption in Maharashtra and he was one of the active crusader behind forcing the Maharashtra government to bring in the Maharashtra RTI act, one of the first in the country. He has given his life for the service of the nation since the last 35-40 years.. He has devoted his life to social activism, mostly in Maharashtra. He developed his village Ralegan Sidhi into a model village which people from all over the world come to see. It is considered a model of self sustainable living and of environmental conservation. The World Bank Group has concluded that the village was transformed from a degraded village in extreme poverty to one of the richest in the country. Anna Hazare lives in a small room attached to a temple in his village since 1975. He has no assets and has a bank balance of Rs 67,000. Whatever land he has is being used for development purposes for his village. His only source of income is the pension which he gets from the Army. He has devoted his life for the betterment of his village, and after that fighting against corruption. He has never done anything for his personal motives. What is most heartening is to see Anna Hazare following Gandhian principles and using the same methods of fasting and Satyagraha for his cause. In a generation which has come to doubt Gandhi and the relevance of his principles in modern times, this was ample proof of the relevance of his methods irrespective of time and generations. He has called to our souls in the same peaceful manner that Gandhiji did. More than anything else, the one reason why Anna has resonated with the masses is because he has given hope to millions of frustrated Indians. Everybody knows there is corruption in every nook and corner of the country. But the BIGGEST problem is that nobody can do anything about it. Everybody is helpless in the regard that there is nobody to complaint, and even if they complaint, they end up being harassed by the same people. Anna has given people hope and shown them a way which might lead to a corruption free India. That is why he caught the government totally unaware!! 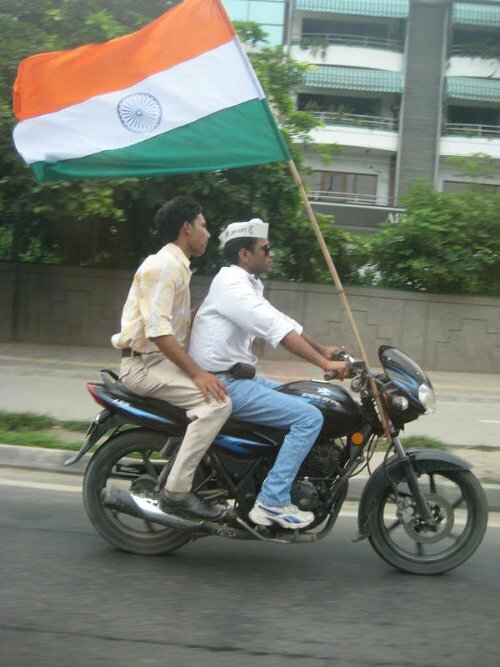 It won’t be wrong to say that Anna Hazare has come as the Messenger of Hope in the current state of our country. He has managed to turn all the cynicism and pessimism into an enthusiastic and optimistic revolution by the people of India. Anna Hazare’s fast and the kind of support it gathered from the general populace have made many people, including the media, compare it to the protests in the middle east countries. There were calls of equating Jantar Mantar with Tahrir Square. While I agree that people are frustrated with the current state of affairs in matters of corruption in this country, it will be unwise to compare both. An Egypt type of agitation is needed when there is no liberty for the people. We have, within our rights as a democracy, the right to peaceful protest under the mandate of the constitution itself. Anna Hazare has asked all of us - "Do you have a conscience?" Our father of the nation Mahatma Gandhi has shown the whole world the way to peaceful protests in a non-violent way and how powerful it can be. Our politics provides us a wonderful platform to raise our voices and bring out change without dropping a single drop of blood. Leaders like Martin Luther King Jr, Aung Suu Kyi, Nelson Mandela has shown the world that Gandhian methods are still relevant. Anna Hazare has also used Gandhian methods, but his fight is not to overthrow a government, but to partner with them in creation of a stronger law. 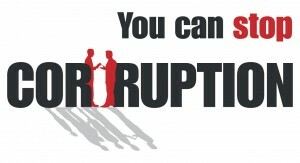 It is very important to see corruption as the villain here and not the government or the ruling party. Civil Society and the Government have to see themselves on the same side of the table to be able to find an effective solution to the problem of corruption. No doubt some members of government are corrupt, and hence the role of civil society to pressurize them to do their job as they are expected to do so. Anna Hazare has created a lot of problems for the government by bringing a lot of questions to the national forum. But the most important question he has asked is for YOU, fellow Indians. He has asked “Do you have a conscience?” The success of his agitation does not depend on how many corrupt politicians come by his side and renounce corruption, he is waiting to see how many people has he inspired to come support him in this cause and other causes which are important to the nation. He is asking you whether you feel for your country, whether you care for a better future for your kids? If the answer is yes, then get up, and join him in this fight and save the nation from the clutches of corruption and other problems we are facing today.